Nigeria vs Zambia: Super Eagles in victory mood – Royal Times of Nigeria. 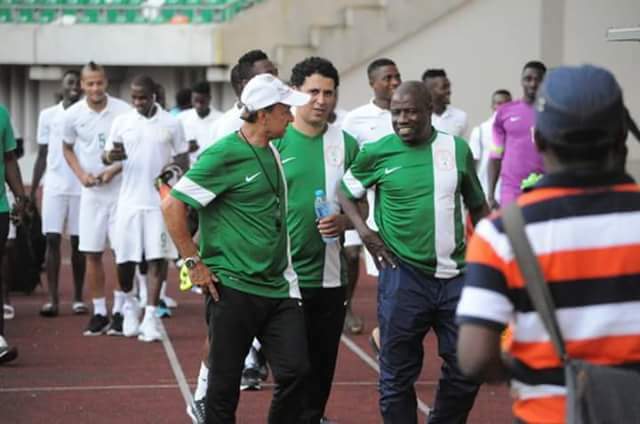 Super Eagles Assistant Coach, Salisu Yusuf, on Thursday said the players were in good mood and ready to conquer Zambia on Saturday in their World Cup qualifying match. Yusuf said the Super Eagles were mentally and physically fit to overcome the Chipopolo of Zambia in Uyo. The coach said that he had absolute confidence in not just his players but their management because they were on top of the cracker between the two countries. “The Super Eagles are in very positive mood for the game against Zambia on Saturday,’’ Yusuf said. He appealed for the support of Nigerians, saying it was necessary for the team to be victorious in the match to be played at the Godswill Akpabio International Stadium, Uyo, Akwa Ibom. The Super Eagles are ahead of other teams in Group B with 10 points and are followed by Zambia with seven points. Nigeria started the World Cup qualification campaign in what many soccer pundits predicted to be the group of death in a blistering form with a defeat 2-1 defeat of Zambia in Ndola to pick their first away win. Nigeria is on the brink qualifying for the 2018 Mundial in Russia with an emphatic 4-0 win over the African champions, Cameroon in Uyo and the reverse fixture in Yaoundé which ended1-1. A home victory over Zambia – a side they beat away at the start of the group phase – will be enough to see Nigeria return to the finals after reaching the second round in Brazil in 2014. Other countries that could all book their spots at next year’s World Cup in the penultimate round of African qualifiers at the weekend are Egypt and Tunisia. That will leave the other two slots to be decided next month.